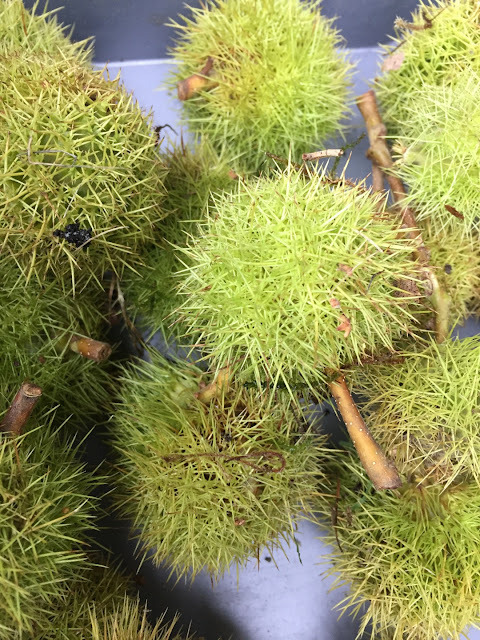 Chestnuts, the edible type, are a tasty treat! They are also healthy as they are high in Vitamins B1, B2,B5, B6 & Vitamins C and in Potassium and Magnesium. For me they are the taste of autumn and Christmas! Be aware, these are spiky little buggers! Most trees will release the nuts from their thorny shell! One of our trees keeps them in the outer shell. You need tough leather gloves to release them. This is the tree with the biggest chestnuts I have ever seen...off course! 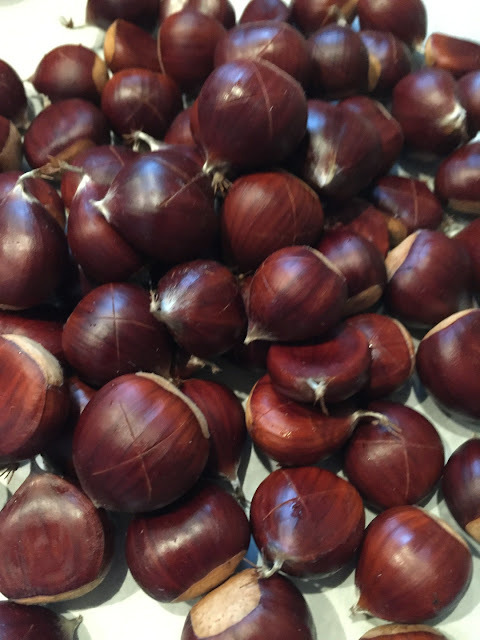 You can also put the closed spiky shelled ones in a basket in a warm place for 24h, they will open and it will be a little easer to retrieve the nuts. But you will still need good thick leather gloves. Work with them pretty soon, as they are bad for storing. They will keep at the very most 2 weeks in the fridge. 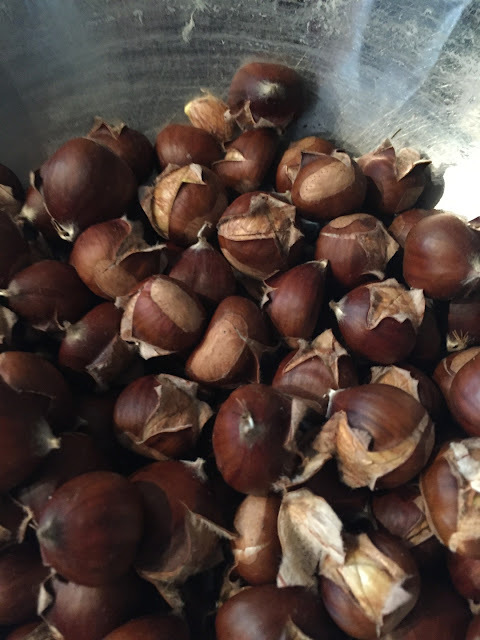 Once you have released the nut, all you need to do is cut an x in the shell with a little sharp knife! This procedure will blunten your knife. If you want to cut a lot of nuts, you will need some sharpening device for your knife at hand! Cut the x on the round side of the chestnut not the flat one! Also make sure your x-sides are long enough, this will make peeling so much easier. BTW, if you bake them in the oven, without cutting them, they will explode! Peel while hot! Once they cool down it will get more and more difficult to peel them. If you got side tracked and return after they cooled down try a small spoon to help you release the nut. There are many yummy treats you can make out of these, but the easiest is to just enjoy them right there and then! They can also be ground into a gluten free flour! Or make a very yummy tasty bread spread, think of the Italian 'Crema di Maroni' ! I also had some in my Butternutsqash Risotto last week. Or tonight roasted with Brussels sprouts. Next on my list will be a chestnut apple jam. Oh, I'd love to read more about that 'Crema di Maroni' or the chestnut apple jam! I haven't tried the jam yet. The 'crema di maroni' tasted very good, though! I feel like running to the store and a buy a bag of chestnuts. I love their earthy texture. 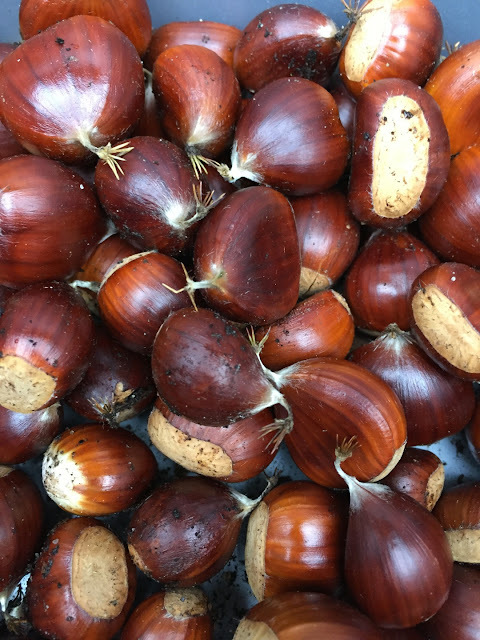 I tried roasting chestnuts in the oven once - they all exploded! Scared the living daylights out of me as they went bang bang bang one after another. Cleaning that oven was no fun! No one told me I had to pierce them first! Oh my, I don´t want to imagine what the oven looked like! Good that non shot through the glass. My Sister and I once emptied a vase with wrinkled autumn decorations into the open fire. There were a few horse chestnuts in with the messy bunch, they exploded in the fire and scared us. Luckily the gate in front of the fire was solid enough to hold them off from shooting through the living room! They quite some power shooting around! they are nasty little buggers alright. The last place you would want them is at a playground.